This article will cover translating the X theme into any language apart from the default (en_US). 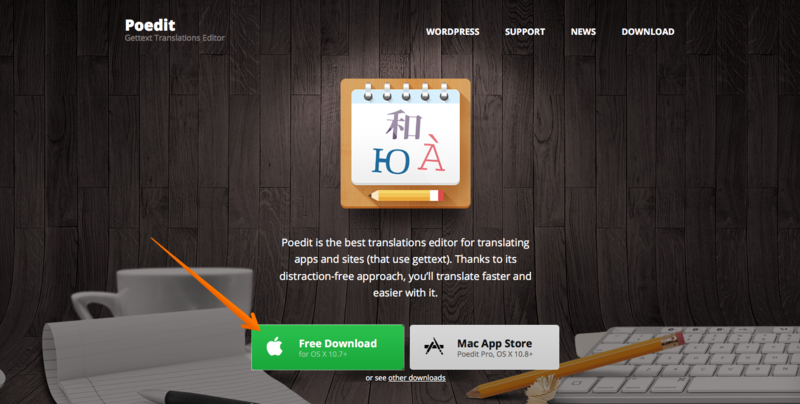 This article won't cover translating plugins, if you'd like to learn about translating plugins, here are some great articles you can check out. We'll be covering one main method of translation and then have a brief section on other ways you can translate. For the purpose of this article, we'll just be translating one string as an example, but this same principle applies to translating the whole theme. The specific string we're translating is "Below you'll see everything we could locate for your search of" for this article, we're going to use Deutsche, but you can translate in any language and we'll cover that below. For the translation, we'll be using a tool called "Poedit" Poedit is a translation tool for translating strings from there original language to the one you want. It's simple to use and quite straightforward. 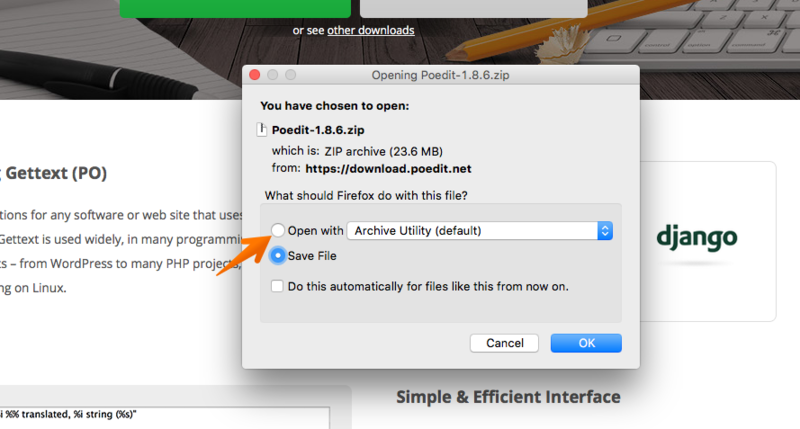 Click on open and unzip/uncompress the zip file, the file just contains the Poedit application. Congrats! Poedit is now installed and ready to use. Open up your FTP program and login with your FTP credentials, if you don't know where to find these, you can use the cPanel file manager or ask your host. It's worth noting here though that not all file structures will be the same if you get stuck at all, open a support topic here and we'll be right along to assist. 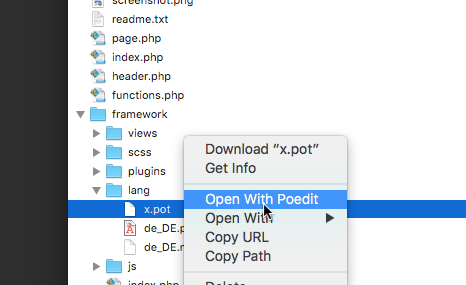 Right-click on the x.pot file and click "open with Poedit". 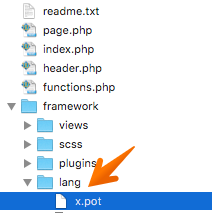 Note: If you don't have the same option, right click and download the x.pot file and then open with Poedit, either way, is fine. 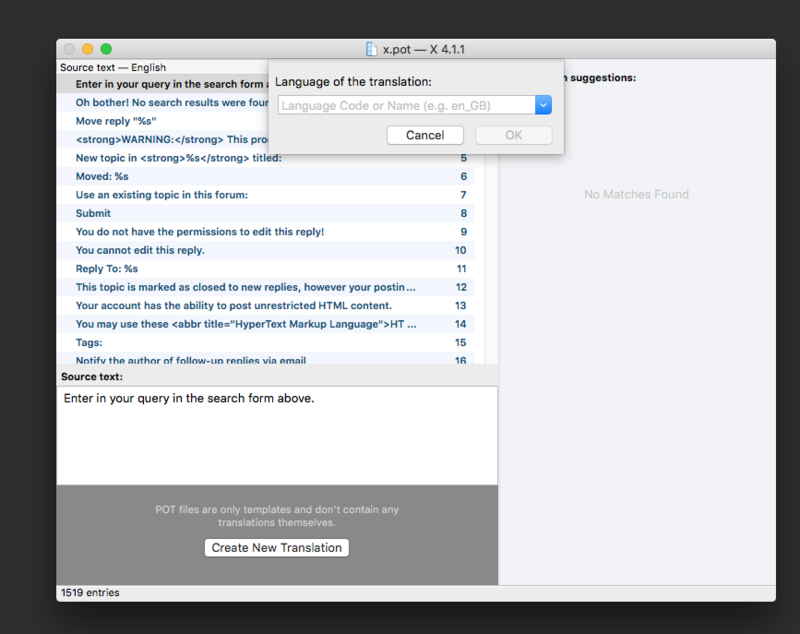 Click on "Create New Translation"
Enter the language of the translation itself. This would be the country code or you can use a country name, so for German, we could use de or just type "German". Once you've done that click "ok" and your new .po file is automatically created. Now it's time to actually translate the theme, as we covered further up, for this purpose of this example, we're just going to translate one string, but you can translate as much or as little of the theme as you want and what you've translated will still work. So the string we're going to translate as mentioned earlier is "Below you'll see everything we could locate for your search of". 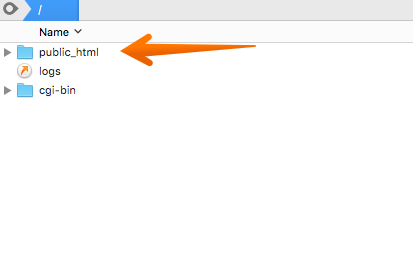 Poedit has a great feature, which allows us to find any string we want. 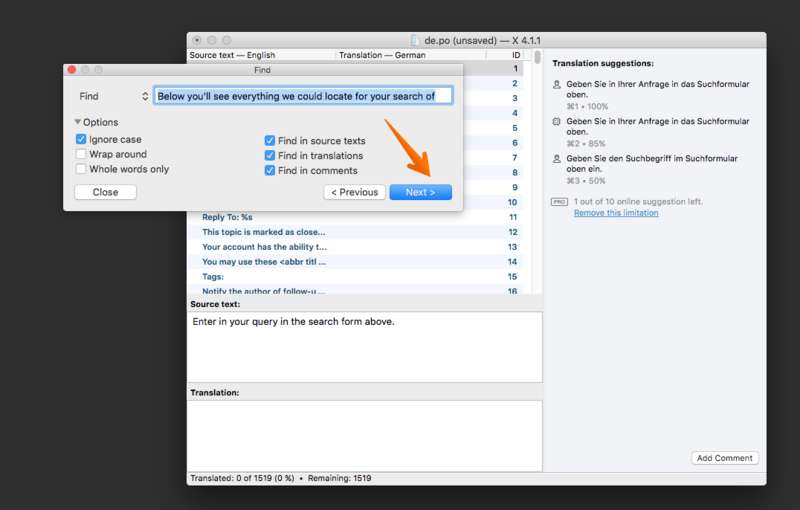 On Mac, just hold cmd + f to bring up the search bar. As you can see, right now our translation for this string is empty, so let's change that. Enter in your translation for that string, so in my case, that's "Unten sehen Sie alles, was wir gefunden haben zu Ihrer Suche nach" As I'm translating in German. Note: At this point before moving on to the next steps, you can translate as much as you want, just go through the file and click on each string in Poedit and add your translation, once you've completed that, follow the steps below. 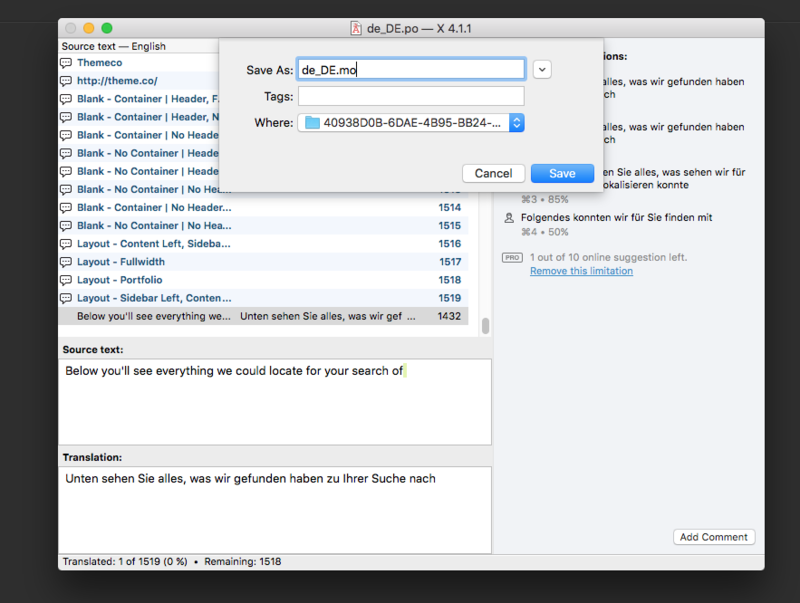 Now you've added your translations, let's make sure we save it, so in Poedit go to > file > saves as, name it in your language code, so for this article as it's German, we'd use "de_DE.po", save it anywhere on your computer, as we'll upload it via FTP (or it should allow you to save it straight to FTP anyway). Phew! That was a long section, but now you have a translated theme! Congrats. Important! Uploading your translation files to the parent theme will mean they'll be overwritten on a theme update and lost. We'd highly recommend the following two methods below instead. Create a "languages" folder in your child theme, for example, /wp-content/themes/x-child/languages and upload your translations to that file. 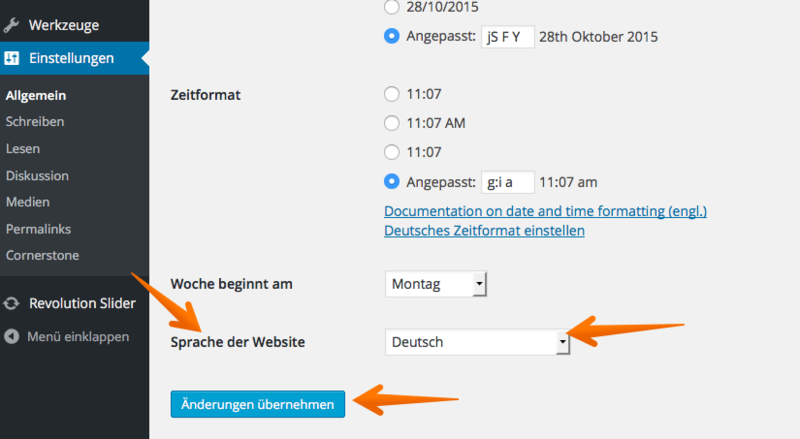 This tells WordPress to find the translation in the child theme languages directory. 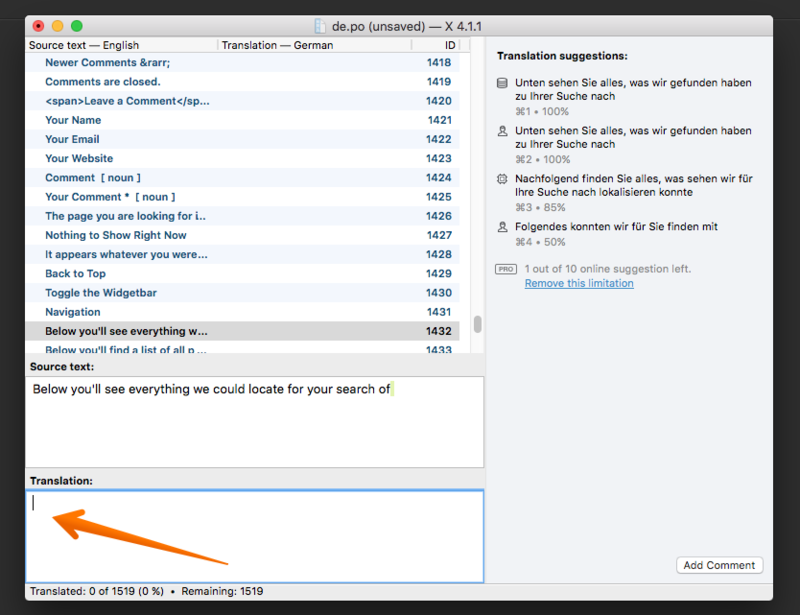 Select your language from the drop-down box and click "save". Congrats! You've successfully translated your website. The same basic principals also apply to translating plugins. The code above replaces Description with More Information. You can use the example above and translate/change the text which is generated in the theme. Below are a couple of alternative translation methods, both being plugins, that you can use from within the WordPress admin area to translate themes and plugins. WPML - X includes built-in integration with WPML and works flawlessly straight out of the box, if you already have WPML installed, you can read about translating a theme with WPML here. qTranslate X - A free alternative to WPML, offering the ability to translate WordPress themes and plugins from the WordPress admin. Below is some great further reading material, both on the subject of general translation and more specific topics on translating themes. Is Polylang compatible with Xtheme? Where to download X/Pro Language Packs from? 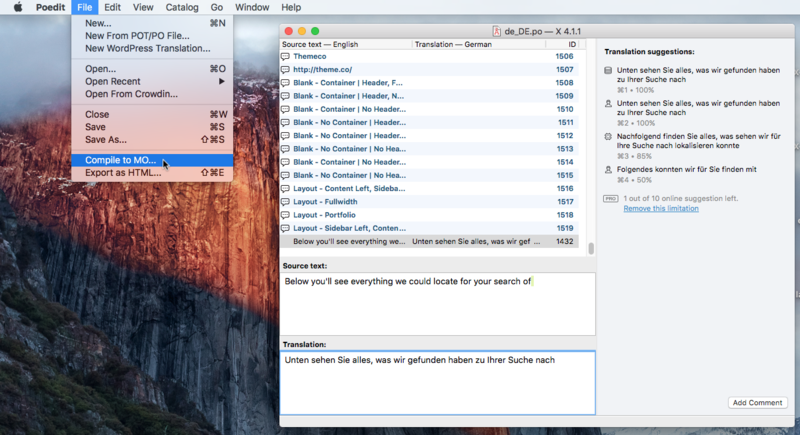 Which translation plugin should I use? 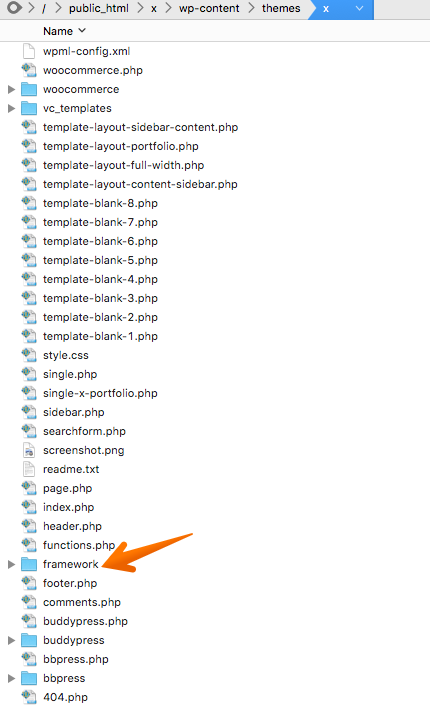 X-theme not using wordpress language settings? How to change default category archive paragraph text? Translate 'Read More' using JS? Change The Term "Filterable Index"
How can i editing the message Read More in the excerpt post? Div. 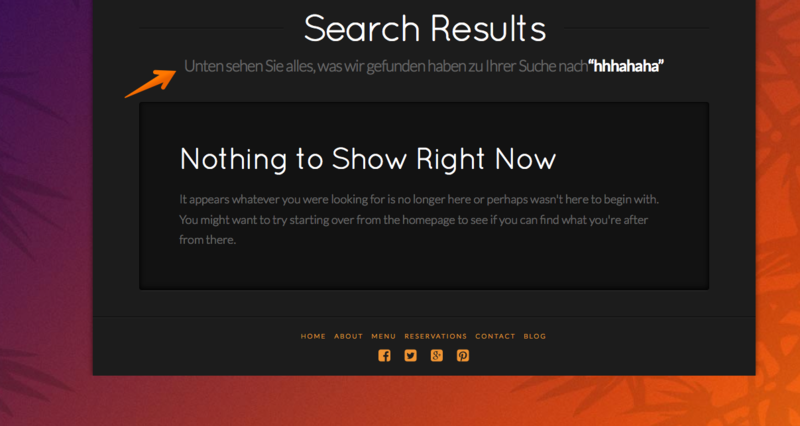 Startup - Problems with using Theme X and "Integrity"
What is Pro's go-to solution for a multi-lingual site?